And I am so thankful I did. It felt like a conversation in my living room with many amazing people chatting and learning together. What did I learn? I clarified my own ideas, and considered a better way to help my students. The first thing any connected person should be is receptive. Open. In order for what we are saying to make any sense, it needs to be a response to something. In almost all fields, connecting with others IS the work. I loved the idea that it’s about adding value; that we all can add value to the wide world. And that we don’t need to worry about those that are not. When connected, look to add value; when connected, look for the shapes and patterns of your perceptions and add value. It’s not to promote or make a point, but to cooperate in the conversation in relevant ways to add to the whole. “Connecting IS the work,” and in connecting — receptively– we respond. Read and comment on blogs; blog a response (this is my response). For my students, we will now read others’ blogs first, blog our response of those that touch our hearts and minds, and comment back with a link to our posts. Yes, we have written posts and then read others’ posts and commented, but I think the better idea is to learn from others first, to find a connection to which value can be added in one’s own world, one’s own blog. Do you see the difference? It brings the conversation and the connection home; a relationship, which may blossom into further discussions or simply be a recognition and acknowledgement of the learning conversation. I’ve always felt I was missing something, and I can still blog for myself, but the connectivity is in adding to the nexus of the cloud, building a bit of relationship with those nodes. Thanks, Stephen. I may not have gotten everything right, but I learned. And it certainly encourages us to expand our connections as educators for Connected Educator month (#ce13). And so I’d like to finish with another example of connectivism. Scaffold the summative assessment and assess performance for each level of understanding.This means that if on the unit assessment a student can perform only the basic levels of understanding (even if this is only 1/4th of the assessment) this means the student’s grade should be a passing grade as they demonstrated the basics of the unit. Now that makes sense more than a percentage score of total points. An A means …., A B means… A C means… Years ago, before all the testing and specific objectives focus, I created units of instruction based on Kathy Nunley’s layered curriculum model. That raised the bar on expectations and allowed all students to succeed. With the emphasis now on interest-based learning and the use of technology tools, the units could offer choices and negotiation of projects to meet student interests, with the emphasis on stretching to meet ever higher goals based on a teacher/student developed framework of expectations. As I develop my Common Core State Standards units and those specific objectives, I will consider Charity’s advice, and I thank her for helping me grow into another way of seeing how this could work. Are you responding to the gifts from others? Thanks Charity and Stephen for helping me grow. 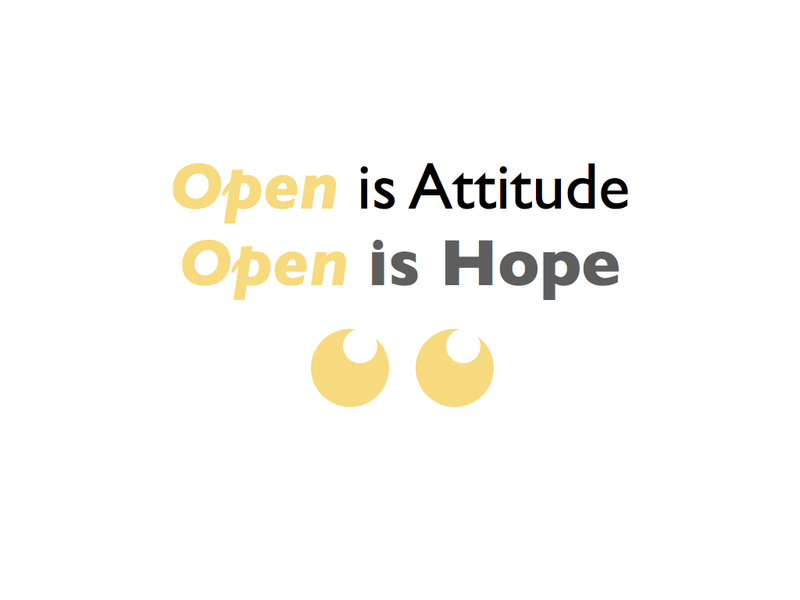 Open is Hope.